Savory. Sweet. Spicy. This recipe is just peachy (literally). 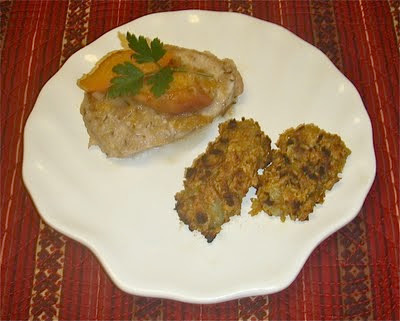 These tender pork chops, with succulent peach marinade, creates a wonderful sauce that gives the pork chops the perfect coating for a fantastic taste. Heat a large skillet over medium-high heat. Heat olive oil, add shallots and thyme. Saute' for 1 minute and add peach wedges. Saute' for 2 minutes. Add white wine and chicken broth. Cook for 2 minutes. Add corn starch and stir until sauce slightly thickens. Remove from heat. Combine salt, pepper, and cayenne pepper in a small bowl. Sprinkle pork chops with salt mixture (both sides) and lay in baking dish. Pour peach marinade mixture over pork chops and sprinkle with brown sugar. Marinate in refrigerator for at least 2 hours. Heat oven to 400 degrees and place baking dish in oven. Bake for 15 or 20 minutes (or until desired doneness). Spoon peach marinade/sauce over pork chops when serving. Enjoy! If you'd like a printer-friendly version of this recipe, Click Here.